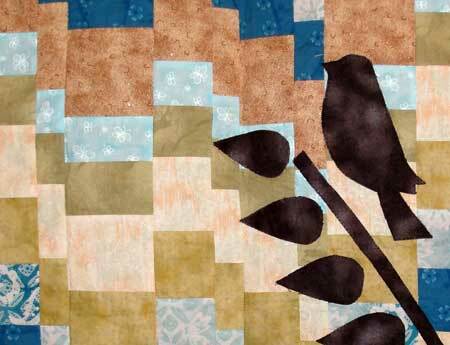 This quilt is a free pattern from Michael Miller fabrics called Bohemian Bird. The story behind the quilt is that I was in the middle of studying for finals my second semester at law school when I just couldn't handle reading another case. So I procrastinated by piecing this together instead over a period of days when my time was perhaps more wisely spent on other matters. This was my first attempt at fusible applique and securing the pieces with a blanket stitch. Good thing the pieces are so simple and large. 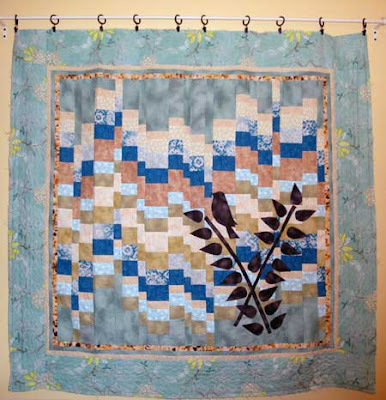 This was also my first bargello quilt and it was a lot of fun to put together and not as difficult as I thought it would be. It only took me 2 years to actually get around to quilting it. But after quilting the bugger (50" x 50") on my domestic sewing machine and washing the quilt, I decided I didn't like the quilting after all. So I spent the rest of 2010 unstitching all the quilting and removing the binding. Not something I recommend. This quilt now hangs in my bedroom unfinished and is officially a work in progress and will probably remain a work in progress for a looong time.